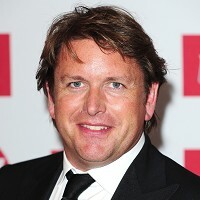 Passengers on board the new P&O Cruises ship Britannia will have the chance to attend cookery classes run by celebrity chef James Martin, the firm has revealed. He will join patissier Eric Lanlard to lead a cookery club for holidaymakers on board the cruise liner when it begins operating next year. Creations by top chefs Marco Pierre White, Atul Kochhar and Olly Smith will also be available to eat in the ship's restaurants. P&O Cruises has announced more details of the 141,000-tonne cruise liner, which is due to set sail for the Mediterranean on its maiden voyage on March 14 2015. Scheduled stops on its first two-week cruise will include Barcelona, Monte Carlo and Rome. Those on board the Italian-built liner will be able to enjoy a three-tier atrium, 13 bars and 13 different places to eat. The ship also boasts a spa, a sports arena, four swimming pools, entertainment arenas, a dance hall and an art collection worth more than £1 million. All outside-facing cabins have balconies and there are 64 suites. Britannia will have 1,837 cabins, with capacity for 3,600 passengers. Travellers who book tickets for the voyage, which will depart from the ship's home port of Southampton, can find cruise travel insurance to offer extra peace of mind ahead of their trip. Other voyages lined up for Britannia's opening season include visits to the Caribbean, the Baltic and the Canaries. Its first British Isles cruise will be a 12-night voyage beginning on July 6 next year. Stops will include Edinburgh, Glasgow, Liverpool, Dublin and Cork. Christopher Edgington, marketing director at P&O Cruises, said: "Britannia will introduce cutting-edge design combined with a range of innovations uniquely styled to appeal to those who may not have considered a cruise holiday before, as well as our many loyal past passengers."